Seeing as the thread started by Trozombo has been hijacked by myself and many others I thought it might prove useful to have a dedicated thread for this particular little area just within the M25 and containing not just the River Colne but also nearby has access to the Wraysbury. Some brief info on the area first... to the best of my knowledge there are no trout in the Colne but it is reported to hold chub upwards of 6lb, Barbel into the high teens, Pike, the usual coarse fish and I have seen video footage of a terrapin at the bend before the river goes under the bypass! The moor itself is common ground and home to a sizeable head of inquisitive cows and a growing herd of horses saved from the knackers yard by a local traveller, they (the horses you understand) can be a nuisance especially right now when they have foals to protect and they do get fed by some of the local walkers so best to be on your guard. As this is common ground it is not maintained and is effectively wild water but the benefit is it is free to fish from the fence at the upstream end of the moor all the way downstream to the railway bridge behind McDonalds at Two Rivers. I rode across the moor this morning and should report that the recent hot weather is starting to lower the water levels with lots of weed now at the surface on the deeper stretches though the riffles and pools are still clear but obviously a little shallower. There is still plenty of fish eating birds out the feasting on the plentiful supply of minnows and fry as are the other predatory fish. If you are venturing over there lets hear about it. A cheeky little session tonight with kids in tow . Tons and tons of takes, mainly from greedy minnow but only one catch a very small chub falling to a self tied dung fly concoction. Water levels have significantly dropped and felt very warm having fished mainly from midstream standing in shorts and crocs. In the final hour there was an explosion of insect life, the likes I've never seen before, at one point I was covered in tiny flies that were using me to emerge from. They looked like a miniature mayfly, brown in colour. The kids were mucking about with a bucket and caught a leach and a couple of flea/shrimp type things so maybe Czech nymphing may bear fruit. Not the most productive of evenings but better than a night in front of the goggle box. Had a couple of sessions lately over on the gravel stream which although they have produced the sum total of one tiny chub the confidence and anticipation could hardly be higher. 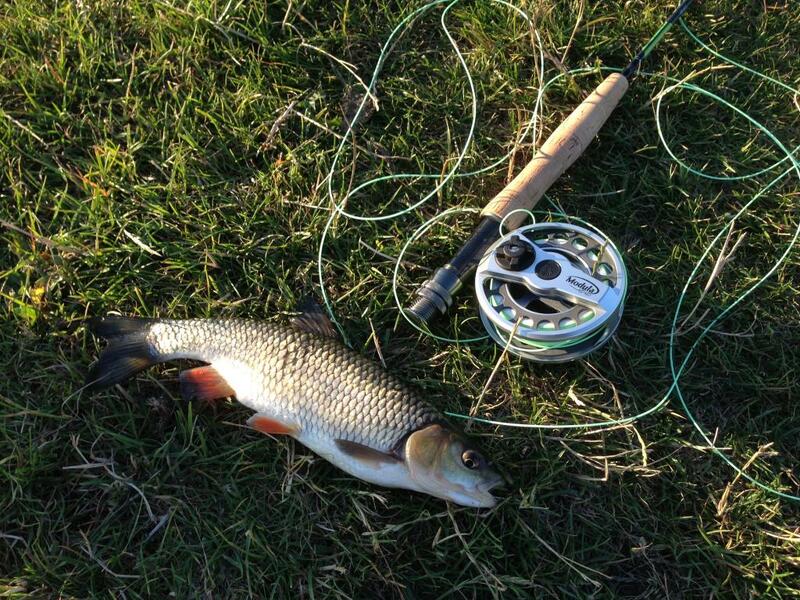 The first visit was to re introduce a friend and neighbour to fly fishing and although a little rusty he did land a decent half pound chub with an F-Fly from a wide shallow pool at around the mid point of the stretch. The real excitement came from a wander further up stream where we found a side pool with very little flow from the main stream. This produced take after take from the top but with the advantage of polaroids there were clearly much bigger fish sifting the bottom. This was late on and the light was fading but I had ear marked this place for the next session which came a week later with our good friend flybysage. We fished our way up stream until we reached this hot spot, along the way there were some decent takes off the top and Nigel lost one smallish chub. A couple of minutes after arrival at 'the spot' it was clear there were fish here, again regular takes from ambitious minnows on the top but over to the left in the still, shallower water were some bigger fish, possibly bream, casually wallowing with their tales in the air, Nigel tried his utmost to tempt them and managed a take with an apps but mainly succeeded in fouling one before being snapped off. I'm not very confident of my river fly fishing skills or the techniques required but for the first time I tried nymphing with a GRHE, this brought me a tiny chub but as I got more adventurous a tequila blob (!) caught the attention of a cruising pair of river carp, neither took it but the knowledge of them being there has got the focus of my determination to get one. This is one of my favourite spots to spend a long summers evening but it always seems a shame that the nights are now drawing in. There may not be any trout in there and using a fly might not be the easiest way of getting the fish out but I love it all the same! If anyone has any tips on what flies carp, chub, bream and barbel are likely to take and how to fish them, I'd love to know. as I got more adventurous a tequila blob (!) . Now there is a natural fly that Iain would be proud that you are using on a river Mick! A great few hours spent trying to tempt bream! As Mick said, I accidentally foul hooked one and when bream are foul hooked, boy do they run! Had one take on an apps bloodworm, again another totally naturally fly! 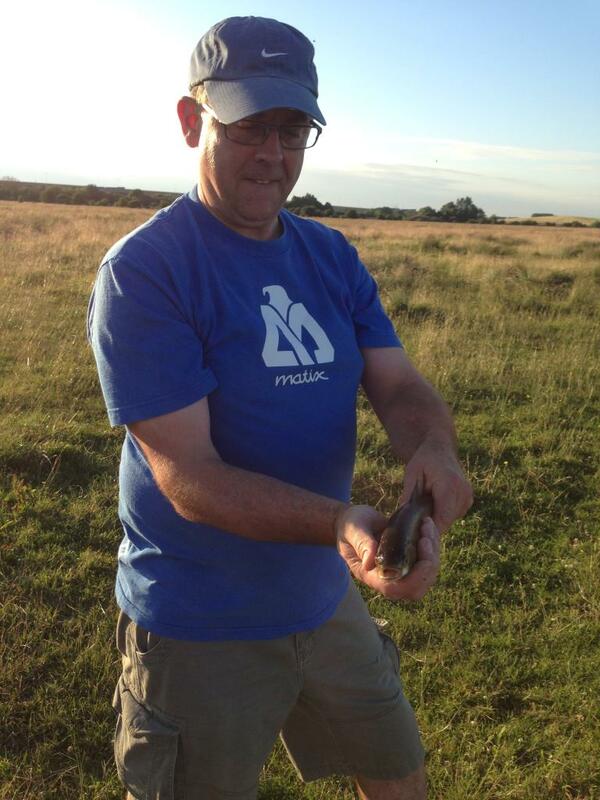 Must go back one evening to get one of those buggers properly caught! !